Have a fun filled Easter with lots of yummy chocolate and gorgeous flowers. The Yummy Easter bouquet is made with lilacs, pinks, blues preented in a bag. Enjoy! 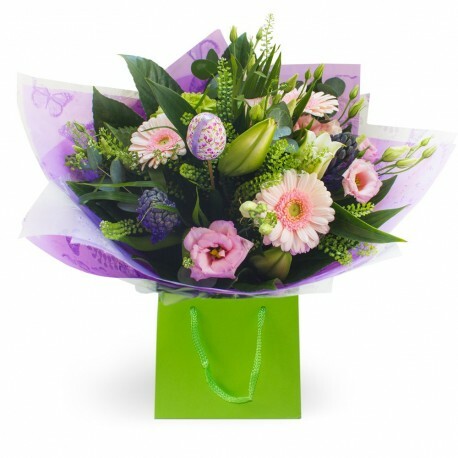 Contains Gerberas, Lilies and Lisianthus with mixed green foliage. Every bouquet is designed and created by professional, qualified, local florists, Emma and her team. The talented florists at Flowers of Kidderminster add a touch of pizazz and style to every bouquet, which is put together by hand, from scratch.